MODESTO, CA. 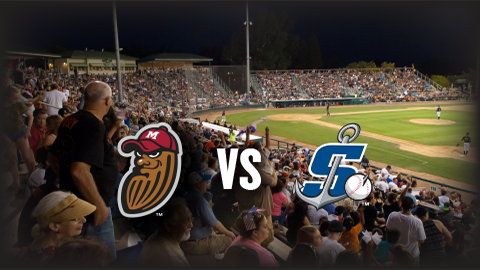 - With lots of chances late, the Modesto Nuts were unable to take advantage in a 6-2 loss to the Stockton Ports on Saturday night at John Thurman Field. In the Nuts' (4-5) fifth straight loss, they left 12 runners on base. The seventh was the pivotal frame. Two Ports' (3-6) relievers combined to walk the bases loaded with no outs. Sam Sheehan struck out Cal Raleigh for the first out of the inning. Joe Rizzo followed and rolled a groundball deep in the hole at shortstop. Nick Allen could not make a clean play on the ball allowing a run to score with the bases still loaded. Anthony Jimenez bounced into a fielder's choice at the plate before Luis Liberato struck out looking to end the threat. The Nuts would not score again. Wyatt Marks (W, 1-1) worked five shutout innings with three strikeouts in his start for the Ports. Nick Wells (L, 0-1) started for the Nuts and got hurt by some porous defense in the first inning. Three errors opened the door for three runs in the first frame. Wells settled in after that retiring nine in a row from the second through the fourth innings. Austin Beck launched a three-run homer in the fifth to open the game before the Nuts threatened in the later innings. Eugene Helder went 2-for-4 with a RBI for the Nuts. The Nuts look to snap their five-game skid on Saturday night in game three of the four-game set with the Ports. First pitch is at 7:05 p.m. Coverage on ModestoNuts.com will start at 6:50 p.m. Listen live online on your phone, tablet or PC by clicking HERE.